Can you believe that it is already the middle of the week? The weekend is going to be here before we know it! Anyone have any big plans? My best friend Katie will be up here celebrating her birthday! I cannot wait for a lovely weekend with friends! This week I have been super busy at work. I am still in the training process so most of my day is spent in training classes. But I am loving every minute of my new job, I have met some wonderful people this past week and a half! I feel as though I am slowly figuring out where I belong! I am loving that this is what I get to look at while I work out in the morning! Ah I love the city! I am loving that I get to spend some quality time celebrating with this lovely lady! I love that I finally feel like all my furniture is in the right place! I may or may not have rearranged my living room furniture 4 times! I am loving that the weather is beautiful! Yesterday was a lovely 73 degrees! 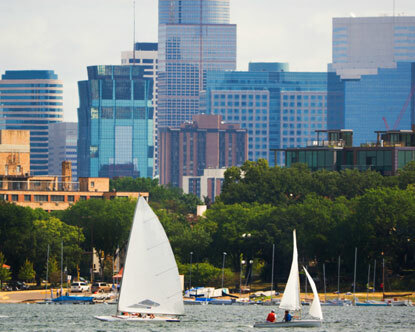 Perfect weather for a leisurely walk around Lake Calhoun! I feel like I could go on and on about the city! But I will stop there for the day! So many good things to be loving this week! I'm glad you're feeling settled in and found the right place for all your furniture! That makes me happy! What a gorgeous wedding dress! !